José Oliva takes an outside seat at Smith & Wollensky steakhouse on a sunny winter afternoon in Miami Beach. A cat prowls the rocks that separate the tables from the water, on the hunt for lizards. Oliva, a 37-year-old with jet-black hair and a solid frame, opens his leather travel humidor, takes out a cigar bearing his family's name, clips the end and lights it, basking in the comfortable breeze. "Inventory is the only measure of a serious cigarmaker-show me your tobacco," says the vice president of Oliva Cigar Co. between puffs on what is one of 13 million cigars his company made last year. Oliva Cigar sits on a considerable inventory of tobacco, and those stocks have allowed it to double its production in just four years. While Oliva Cigar has been making cigars for only 15 years, it has been quite the ride. After struggling out of the gate, Olivas now enjoy a combination of consumer and critical acceptance. Sales are booming among a wide variety of segments, from inexpensive bundle cigars to hip and innovative smokes such as the squat NUb to the premium and robust Oliva Serie V Liga Especial. The company has had a cigar in Cigar Aficionado's Top 25 list for five consecutive years, three of them in the top 10, two of which made the top five. The current year's No. 5 cigar, the Oliva Serie V Belicoso, rated 93 points. The company believes that it's one of the six largest makers of premium cigars for the U.S. market. "We've grown," says Oliva. "I think we have to be the fastest growing company in the business over the last three years." Oliva Cigar (not to be confused with Tampa's Oliva Tobacco Co., which grows and brokers tobacco) makes its cigars in two countries. All of its high-end products are rolled in Estelí, Nicaragua, in a 60,000-square-foot facility. Bundle cigars are assembled in Danlí, Honduras, then shipped to Nicaragua before they are exported. The Danlí operation is a fraction of the size of the Nicaragua factory: it makes some 20,000 cigars a day, compared with 50,000 cigars a day in Nicaragua. The new Honduras factory was built to lessen the company's dependence on production in Nicaragua after Daniel Ortega was elected president in January 2007. It replaced a shuttered facility in Jalapa, Nicaragua. The company grows all of its filler tobaccos, focusing on those grown from Habano seed. The only tobacco leaf it buys from outside vendors is Connecticut-seed wrappers grown in Ecuador, some of which is used as binder. "I believe we have the largest inventory of Habano filler," says Oliva. While that is a claim that might be disputed by other companies in the industry, he speaks with passion about the importance of inventory. Are you really in this game? If you are, you have inventory-scary inventory. Cigarmaking and craftsmanship are important, but there is no substitute for tobacco inventory. The Oliva Cigar Co. story began in the tobacco fields of Cuba in the late 1800s, when Melanio Oliva started growing cigar tobacco. His son Hipolito took up the family business, and his son Gilberto was the first to move beyond his family's fields, becoming a tobacco broker. He focused on leaf that many growers ignored, libre de pie, the leaves that grow closest to the ground and are known as sand leaf. Gilberto Oliva continued to operate even after the Cuban revolution, as the government concentrated on nationalizing larger firms and left smaller ones alone. But by 1964, smaller and smaller businesses were being affected. He knew he had to leave. He left Cuba for Spain, then went to Nicaragua. By 1973, Oliva had three children, and a fourth was on the way. He wanted the new child to be born an American. So he had his seven-and-a-half-months pregnant wife, Carmen, fly to Miami on January 5. She stayed overnight in the airport with her four children, then flew the next day to Elizabeth, New Jersey. "I was born that evening," says José Oliva. "My father insisted that I be born in the United States." Gilberto Oliva traveled the Caribbean and Central America, looking for tobacco that could rival that which he left behind in Cuba. He grew in various countries, and later moved into cigarmaking, working for Nestor Plasencia Sr. in Honduras. In 1995, Oliva and his son Gilberto Jr. created a cigar within Plasencia's factory. They named it Gilberto Oliva and crafted it with a blend typical of the time: Dominican and Nicaraguan fillers, Dominican binder and Ecuador Connecticut-seed wrapper. A year later, they had saved enough to expand, and they opened their own factory in Nicaragua, and shortened the brand name to Oliva. While cigars of all types had sold like wildfire in 1995 and 1996, by 1997 the industry giants had caught up with back orders, leaving the market with far too many cigars. Newcomers such as Oliva faced hard times. Money became scarce. The Olivas were not fond of taking on debt, so they turned to their patriarch's inventory of Nicaraguan tobacco and began making cigars entirely from Nicaraguan leaves, to stretch their dollars. The family never again imported filler tobacco. "For one-and-a-half years, he carried us with his inventory of tobacco," says José Oliva. "Every year my father continued to grow tobacco and put it away. It allowed us to win people over through the consistency of the cigars we were producing. Right from the beginning, the commitment was always more tobacco." "I have grown tobacco in Cuba, Mexico, Honduras, Panama and even the Philippines," says Gilberto Sr., at 78, a rail-thin man with small glasses and a slim mustache. Nicaragua charmed him the most, by far. "Nothing compares to Cuba like Nicaragua," he says. "Northern Nicaragua enjoys all the natural blessings for great Habano." Oliva is a family business through and through, run by Gilberto Sr. and his children. "My goal was to partner with my children to make something they could carry on with pride," says the patriarch. Each handles a different part of the business. 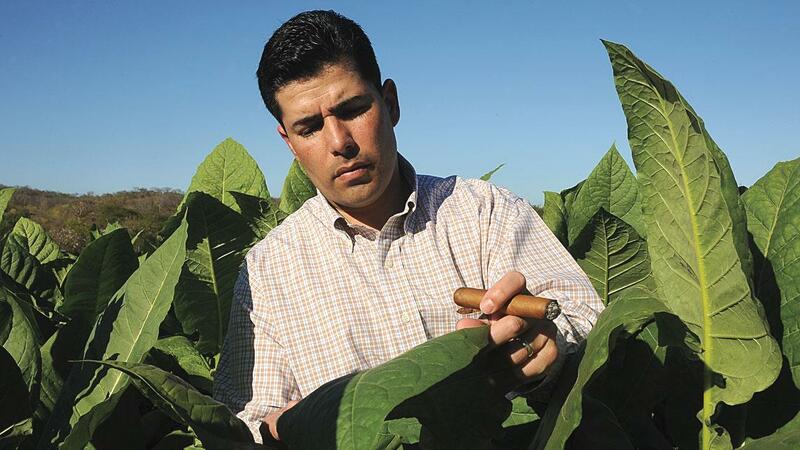 The father handles tobacco growing and processing; Gilberto Jr., 49, is head of leaf growing and company blending; Carlos, 45, runs the cigar factories; Jeannie Oliva-Suarez, 38, runs operations in Miami Lakes; and José handles sales. José is also the face of the company, and grooming him for that position was a family collaboration. While his father traveled the globe-growing tobacco is a business requiring many days, weeks and months spent in the field-his older brothers helped raise him. "Their burden was being able to make sure I could go to school," says José. "To some degree, my brothers were fathers to me." He was expected to excel at his studies. If he didn't, there was trouble. "When I got my report card," he says, "the day of reckoning was with my brothers." José Oliva has turned that sibling pressure of his early days to a personal resolve to contribute to the family business as an entity that is being built to last for generations. "You're not a star in the show, you're a leg in the race-and I take a lot of pride in how I run that leg," he says. The epitome of the modern cigar executive, he spends quite a bit of time monitoring the opinions of cigar smokers via his computer. "The first two hours of the day I spend on the Internet, seeing what's going on, what's being said," he says. One of the hotter Internet topics has been NUbs. These ultra-fat, ultra-short cigars (most are four inches long with ring gauges of 60 or more) are the brainchild of Sam Leccia, a former liquor-industry executive and a passionate cigar smoker who came up with the idea of getting to the sweet spot in a cigar quicker. He rolled the concept NUb in his garage and brought it to the Olivas, for whom he worked at the time as a sales representative. At first, The Olivas were leery, worried that the NUb would be conceived as gimmicky and that it wouldn't resonate with a large audience. "A lot of people said it would be a fad. The feedback was not positive at first. I thought it would be absolutely relegated to boutique status among a small group of people. But there was fertile ground there," says Oliva. "The smoker embraced it from the start. There's sincerity in it. The proof is in the imitations." And the sales. At Cigar Aficionado's Big Smoke Las Vegas in November, Leccia spoke about the success of NUbs, which he called a $10 million brand. Oliva has plans to expand the line-the sawed-off smokes are made in four wrapper varieties, and more versions (including one that will be rolled in Miami) are in the works. "I take a tremendous amount of pride in NUb....it's a real and permanent part of this business," says Oliva, although his embrace of the cigar is still not a hearty bear hug. "It doesn't define our company and it doesn't define our business." Other cigar companies have come out with similar shapes. "It's both flattering and it legitimizes the segment. It says our risk was a correct risk." Last year Oliva came out with another nontraditional cigar with Leccia called Cain, which is made with unusually large amounts of ligero, the strongest type of filler. The goal, says Oliva, was to do "something that wasn't done before." The initial creative stage of Cain included prototypes that used only ligero, but they were abandoned. "We rolled a 100 percent ligero cigar-it was like drinking 151 rum. It can never be 100 percent-you need combustion." The final product clocks in at a healthy 82 percent ligero. That proportion, which is based on the tobacco used to make 1,000 cigars, is broken down in detail on each box, which reveals the percentage of ligero that comes from Estelí, from Jalapa and from Condega. It's a sign that Oliva understands the changes in the marketplace-this is an age where cigar smokers are thirsty for ever more information about the cigars they smoke. Cigars such as Cain and NUb are powering Oliva along. "The most dynamic [part of our business] is this arm, more cutting-edge cigars, less traditional. It's allowed us to be in an area we're not always comfortable with," says Oliva. "It's very exciting. It's also taught us a lot about the demographic of a smoker. If you go back seven or eight years, some of the blends you see now wouldn't have been accepted." Oliva still does a considerable business making cigars under contract, both as sizeable brands made for other cigar companies and via private-label smokes made for cigar shops. "Oliva makes two lines of cigars for us, the Savinelli Liga Especial and the Savinelli Special Selection 2005," says Ruben Ysidron, chief operating officer of Savinelli Inc. "Carlos and Gilbert are two of the nicest people I have worked with in my 40-year career in the industry. Their father Gilbert Sr. is the most knowledgeable tobacco grower I have met, in addition to being a very humble, down-to-earth person. Our relationship is more one of family than business. Their production standards are excellent and their production staff have many years of experience. I can only say that working with the Olivas has been a delight." While Oliva has done well with the flashy NUb and made a fine business from its contract brands, the company's greatest critical success has come via a very traditional smoke-the Oliva Serie V Liga Especial. The cigar first hit the market in 2006, and it has appeared on Cigar Aficionado's Top 25 list for three consecutive years, twice in the top five. The cigar is stronger than previous Olivas, while maintaining the signature balance and complexity that has endeared the company to cigar aficionados. "Our cigars are best characterized as full flavored but smooth, truly Nicaraguan with Cuban heritage," says Gilberto Sr. "Nicaraguan tobacco is rich and flavorful with strength to spare." José Oliva says the Serie V is "on eternal back order." Out of the company's 350 rollers in Nicaragua, only 22 make that cigar, and unlike the others they are paid by the day, not by how many cigars they roll, allowing them to concentrate more on each cigar. "Those 22 guys get paid by salary, not production," says José Oliva. "We feel it's our foundation cigar." Like other Olivas, it also comes at a reasonable price. Since Oliva came to the market during a very difficult time, the company had to be conservative with its pricing, and while prices have risen over the years, the Olivas are still known for their affordable pricing. The Serie V starts at only $5 a smoke and tops out at $9 for the more limited maduro version. Oliva sells its cigars through an 18-person sales force, some of whom were recruited from inside cigar shops. They were cigar lovers first, salesmen second. Dave Wagner, the national sales manager for the company, was a cigar enthusiast smoking at the International Cigar Factory Outlet in South Norwalk, Connecticut, when he began working for Oliva, leaving a job at Purdue Pharma. "Dave took an enormous salary cut to come work for us," says Oliva. The Olivas have been more aggressive than many American cigar companies in moving its sales beyond the borders of the United States. Five percent of its sales come from outside the United States, and Oliva cigars are sold in 18 countries. José Oliva has looked at the expansion as a long-term goal, even if in some instances it doesn't make money. "We don't see every global market as a profit opportunity. In Holland, non-Cuban, we're probably No. 1. In Switzerland, No. 2, in London, No. 2 or No. 3. Our goal is to compete at a global level, and we insist on being a global brand." He says that it is in Europe where the cigars go up against Cubans on their own playing field. "It's a huge source of pride for us," he says. The sun has set. Oliva reaches back into his travel humidor and takes out a pair of well-made pyramids with very dark wrappers, Oliva Serie V Maduros, one of the company's rarest cigars. He lights his smoke, and the conversation continues over the last drops of Caymus Special Selection wine from the Napa Valley. "For a long time, people said ‘a fine cigar has to be Cuban, a fine wine has to be French.' Wine does not have to come from the most noble vines in France to be a great wine," he says, taking a contemplative puff on his smoke. He reflects, thinking upon how his company has managed to thrive while combining the tenets of tradition and experimenting with the thrill of modern trends. "Some change is not necessarily for the best," he says, "but some change is good."